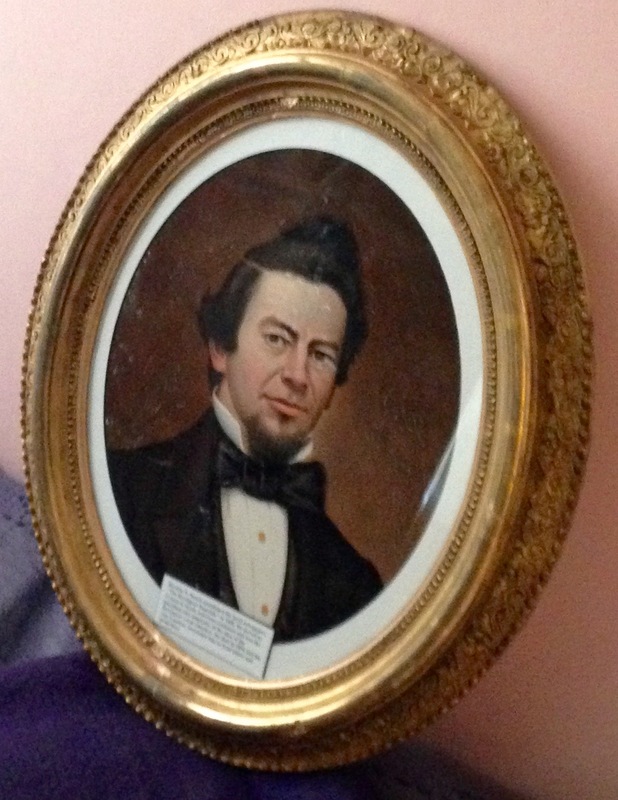 An oil painting of Horatio N. Beach, prominent Brockport resident, has been preserved as part of the Emily L Knapp Museum’s Adopt a Picture Program. The painting is dated June 20, 1858 and was signed by Jerome D. Fielding, a local artist. This oil portrait of Horatio N. Beach painted by Jerome D. Fielding, Brockport Artist, in 1856 has been preserved through the Adopt a Picture Program. Horatio N. Beach (1826-1896) came to Brockport from Connecticut in 1856, and was widely involved in public life. He’s most often associated with the newspaper he established in 1856, the Brockport Republic, which he ran until 1871, when his son, Lorenzo Beach, assumed the role of Editor and Publisher. Aside from publishing the Brockport Republic, Horatio Beach was a driving force in both Brockport’s business and foundational history. 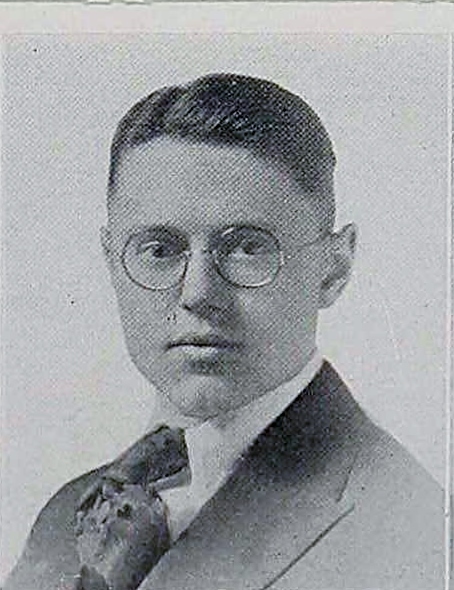 Beach developed new streets, organized the Brockport Rural Cemetery Association, established the Union Agricultural Society at Brockport, and created a free library that circulated hundreds of books to the Brockport community. The recently restored Soldiers’ Monument on Owens Road was the brainchild of Horatio N. Beach, conceived to honor Brockport soldiers who lost their lives in the Civil War. Beach also had an international presence, serving as US Consul to Mexico, Ecuador, and Venezuela 1880s. Horatio Beach died in his home at 69 State Street on September 21, 1896. Jerome D. Fielding, a Brockport Artist, was born circa 1822 in Sweden, NY. Few pieces of his artwork date back to 1840, but the majority of his professional works date between 1858 and 1867. 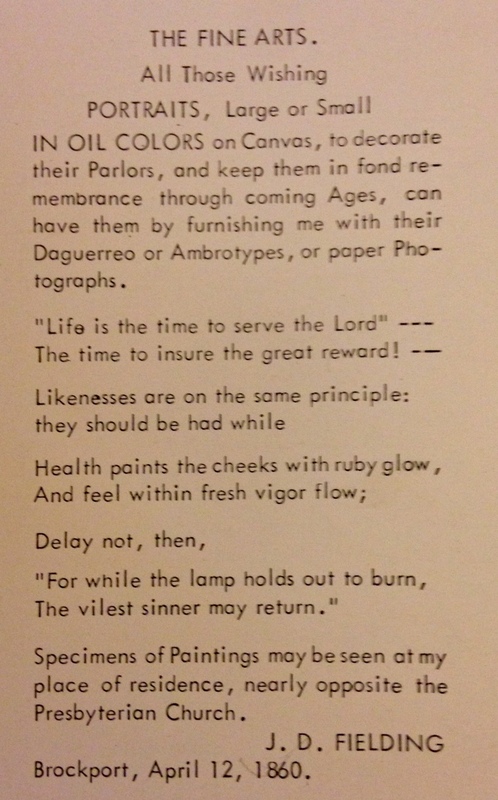 In one of JD Fielding’s early advertisements, he encourages clients to preserve their likeness by providing paper photographs, Daguerreotypes or Ambrotypes “while Health paints the cheeks with ruby glow” (Brockport Advertiser, 1860-1862), from which Fielding would produce a portrait using oils on canvas. He opened his home at 8 State Street, noted in advertisements as “nearly opposite the Presbyterian Church” (and since torn down) for potential clients to see samples of his work. Fielding suffered from tuberculosis for many years before his death on January 24th, 1870 at the age of 47. Representatives from the Emily L Knapp Museum will be at the Seymour Library’s 7th Annual After Hours @ the Library from 7 to 10 pm on November 7th, 2015 if you would like to adopt a photo. Also, photographs and artwork like the painting of Horatio N. Beach can be adopted by visiting the Knapp Museum during our open hours (Tuesdays from 6-8 pm, Wednesdays from 2-4 and 6-8 pm to choose the specific photograph you’d like to preserve. Each adopted photo will have a label noting who has preserved the photo or if the photo was preserved in memory of a loved one. If you’d like to adopt a photo, but are unable to visit the Knapp Museum, we are happy to accept donations of any amount by check. Please specify “Adopt a Picture Program” in the memo line. We will choose a photo to have restored in your name. By taking the necessary steps now, our valuable collection will be here for your children, grandchildren, and great grandchildren to enjoy. Though we don’t know the identity of the woman in the photo, the technique was meant to capture many images suitable for a locket or brooch. Our best guess is that the image was captured in the mid-late 1800s or very early 1900s. 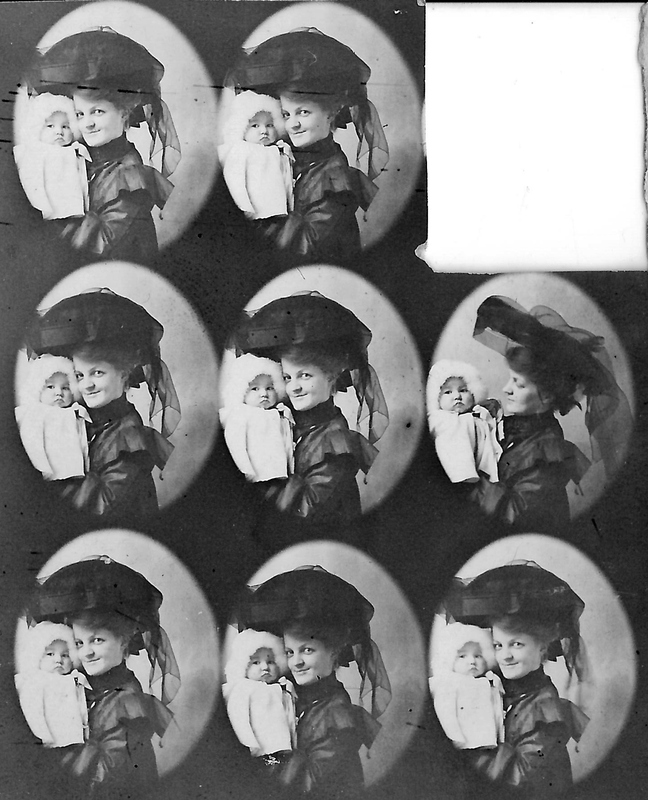 It was likely that the camera used to take these images had multiple lenses and shutters to expose only a portion of the negative for each photograph, allowing for multiple images to appear on one sheet. You can see in the second sheet of photos with the woman and baby, there is one photo missing. Presumably, that is the photo chosen to go in the locket. Click here to see our newest mysteries from the 1950s. Tozier Drugstore, Main Street, circa 1895. So far, the Emily Knapp Museum has preserved fifty historic photos in the gallery with help from the Brockport community as part of the Adopt a Picture Program. 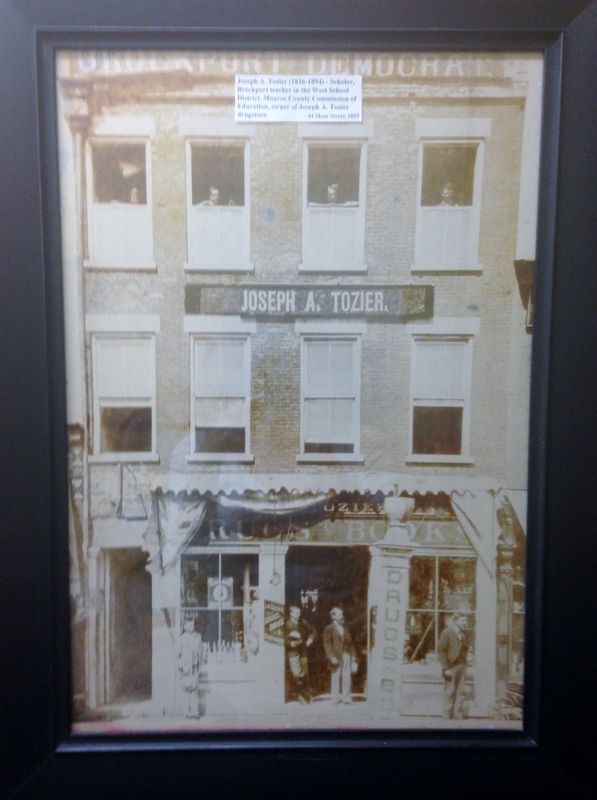 The photo to the left, of Tozier Drugstore, was adopted by Dan Burns in memory of his parents, Dorothy and Tom Burns. If you’d like to adopt a picture, but live far away, you can email us at museum@brockportny.org. You can also donate to the program without specifying a picture by indicating “Adopt a Picture” on the memo line of your check or money order. Please stop in and revisit Brockport history during our open hours: Tuesdays from 6-8 pm, Wednesdays, from 2-4 pm and 6-8 pm, and during our extended hours the first weekend of every month (Friday evenings, 6-8 pm, and Sunday afternoons, from 1:30-4 pm). Leland Twichell Shafer, age 20. The Emily Knapp Museum has acquired many boxes that were left behind in the attic of 19 Park Ave, a home that belonged first to Fred and Josephine Shafer, and passed to their children, Leland and Vivian Shafer. As we go through the five or so boxes containing personal correspondence, poetry, and finance records, we will attempt to put together a portrait of Western Monroe Historical Society’s benefactor, Leland Shafer, and Leland Shafer’s sister, Vivian, whose Shafer Trust generously supports the Emily L Knapp Museum, the Seymour Library and also the Western Monroe Historical Society. The only documents relating to Vivian in the collection are financial records, while the remaining documents pertain to Leland Shafer. 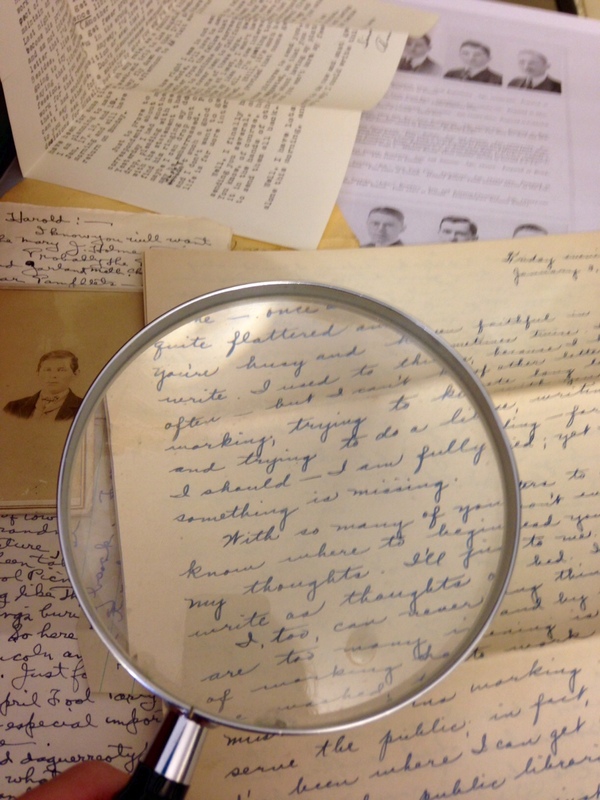 So far, we have found, in Leland’s correspondence with a woman in California named Anne Mueller, evidence that Leland was private, lonely, thrifty and sentimental, sometimes writing his pen-pal more than twice a day. Neither Leland nor his sister, Vivian, married or had children. And since we don’t have the letters he sent to Anne, we rely on the letters he saved from her to speak to his personality. “Something is missing.”- Anne Mueller, in her letter to Leland, 1947. A snapshot of some of the letters we’ve found. You’ll notice that Anne Mueller, Leland’s pen-pal, wrote in her 1947 letter that “something is missing.” The two had a lengthy relationship, at times bordering on courtship, though they never committed. We will keep you posted as we compile the profile of this important Brockport resident. Leland passed in 1980, and Vivian in 1975. If you have any memories, photographs, or artifacts of Leland or Vivian Shafer, please comment below or contact us at museum@brockportny.org. The Brockport Post Office was located at the corner of Main and Market Streets circa 1905, in the Decker Block, which you’ll now recognize as Bittersweet. The Emily L. Knapp Museum & Library of Local History is the repository of hundreds of photographs dating back to Brockport’s earliest days. Old photographs reveal much about our history, the people who settled in the area, and the buildings that once graced (or continue to grace) our thriving village. Unfortunately, photographs deteriorate with exposure to simple elements like sunshine or indoor lighting. 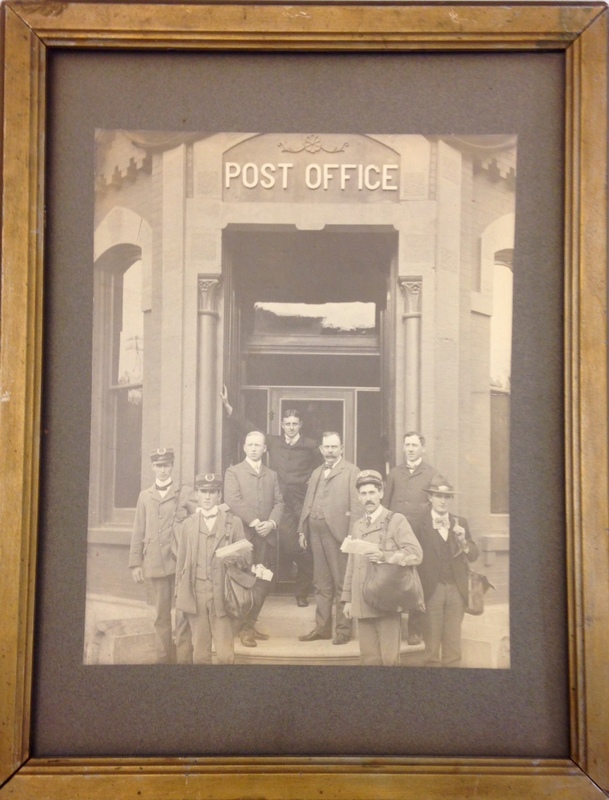 In order to upgrade the housing of the Knapp Collection, the Emily L. Knapp Museum Board has instituted an Adopt a Picture Program, which will provide archival glass and matting to photographs like the one at the left of the Brockport Post Office in 1905. Pictures can be adopted by visiting the Knapp Museum during our open hours (Tuesdays from 6-8 pm, Wednesdays from 2-4 and 6-8 pm, with additional hours the first Friday of every month from 6-8 pm, and first Sunday of every month from 1:30-4 pm) to choose the specific photograph you’d like to preserve. Each adopted photo will have a label noting who has preserved the photo or if the photo was preserved in memory of a loved one. Frame Wright in Spencerport has offered us outstanding prices to add conservation glass (to protect images from 99% of UV rays) and acid-free matting and backing to adopted photographs. Donations of $20 preserve small photos, $45 preserve medium photos, $75 preserve large photos, and $125 preserve extra large photos. If you’d like to adopt a photo, but are unable to visit the Knapp Museum, we are happy to accept donations of any amount, by check. Please specify “Adopt a Picture Program” in the memo line. 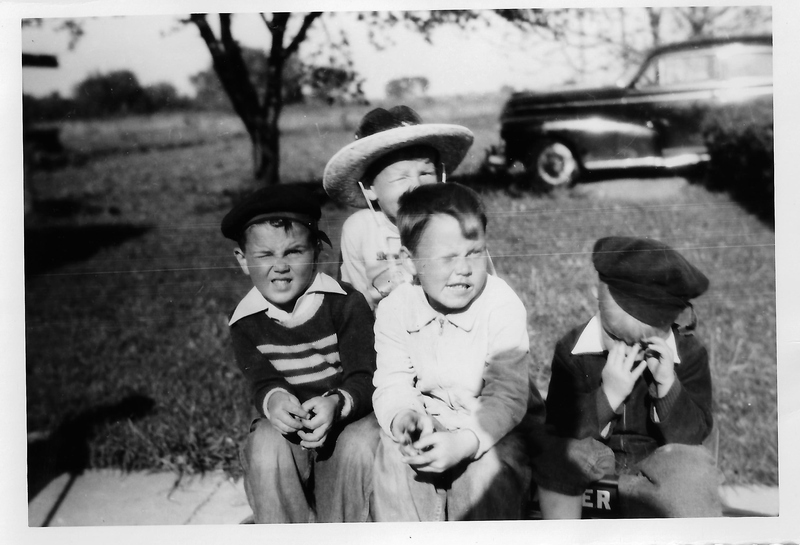 We will choose a photo to have restored in your name. Do You Remember Emily Knapp? 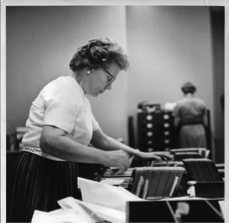 As a Historian, Emily Knapp focused on the keeping of Brockport History, but what do you remember about Historian Emily Knapp? Check out our brief biography of Emily Knapp here, along with copies of the Brockport histories she written, but feel free to share any anecdotes you have of this local Historian by clicking the ‘Leave a Comment’ option above or commenting in the ‘Leave a Reply’ option below. 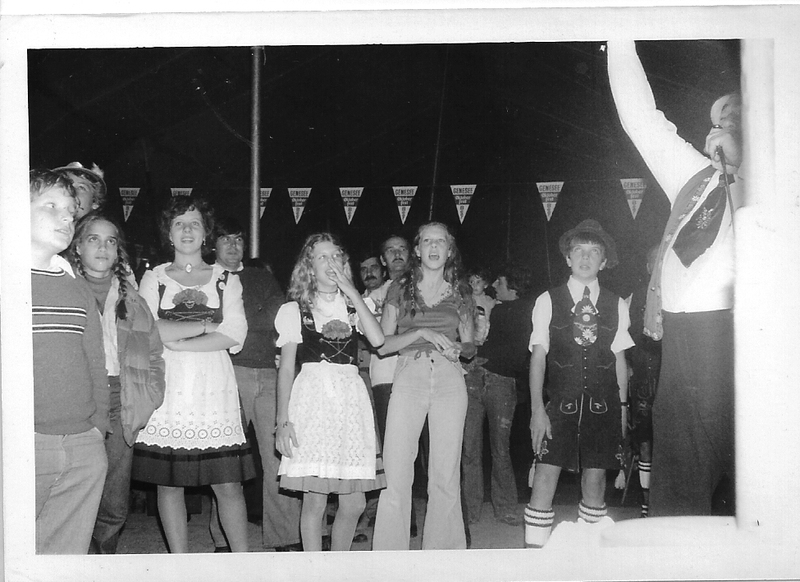 Check out our gallery of unidentified photos! Welcome to the Emily L Knapp Museum and Library of Local History! The Emily L Knapp Museum is a municipal museum associated with the Village of Brockport. The museum is located on the second and third floors in the former home of one of Brockport’s most prominent families, the Seymours, while the first floor contains the Village of Brockport offices. Those who visit Brockport’s collection of local history will feel they’ve entered a time when the Erie Canal was the bustling commercial center of this Victorian village: when ladies wore high-laced shoes and skirts that scraped the slate sidewalks, and the gentlemen sported tall silk hats; when phonographs and stereopticon views as well as novels by our famed authoress, Mary Jane Holmes, entertained the masses. Don’t take our word for it, see for yourself. 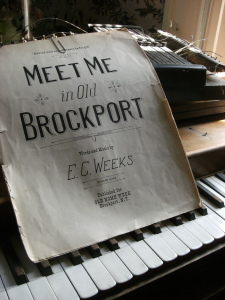 Visit this page for updates on museum happenings and Brockport nostalgia. Follow us to receive a weekly dose of Brockport history!